Every great movie is filled with obstacles that a hero must overcome to achieve his goal. Sometimes great obstacles, however, don’t just stay on the script page. Instead, they become part of a film’s actual production. Movies are epic endeavors, especially when they're helmed by filmmakers with grand visions. But along with those high standards and incredible goals come all sorts of production nightmares. The movies on this list almost didn't get made thanks to production struggles that brought the process to a halt. There all kinds of obstacles movies overcame to get made. Costs skyrocketed on Cleopatra and The Abyss, one of those films nearly bankrupted one of the biggest movie studios in the world. Think everyone just gets along on a movie set? Think again. One famous actress got so upset with her director that she threw a cup of urine in his face. Two crew members from another production were so angry about being fired that they spiked the crew’s soup with PCP. Read about those stories and find out about other movies that almost didn't get made. Obstacle: Shooting almost an entire film underwater. There's a reason why James Cameron is known as "the scariest man in Hollywood." The making of The Abyss (1989) has been called one of the toughest films to shoot in history. Most of the sci-fi drama takes place under water, which is obviously an extremely difficult place to film a movie. On the first day of shooting, the 150,000 gallon water tank built for the film started to leak. Once filming finally got under way, Cameron almost drowned in the tank while setting up a shot. The actors were even required to become certified divers, and there were no stunt doubles used in the movie. Actress Mary Elizabeth Mastrantonio suffered an emotional breakdown, as actors worked 12 hours a day, 40 feet underwater. The crew had it even worse because they were stationed even deeper, so deep in fact, that they would have to decompress in order to surface safely. Obstacle: Extremely cold temperatures and all around difficult production. The Revenant (2015) is a true story about a frontiersman who courageously battles the extreme elements and somehow survives. Some crew members who worked on the movie called it the worst experience of their careers and a "living hell." There were the extremely cold temperatures, the production nightmare of director Alejandro Iñárritu's desire to shoot the movie in chronological order, and several crew members who couldn't handle the ordeal and quit during filming. In the end, it all seemed to work out. Both DiCaprio and Iñárritu won Academy Awards for their efforts, and The Revenant was a box office success. Obstacle: You name it, it happened. The entire production of Francis Ford Coppola's epic masterpiece was riddled with issues. Lead actor Harvey Keitel was fired after two weeks and replaced with Martin Sheen, who was dealing with own alcohol issues. There was total chaos on the movie set, which was located in the Philippines: Coppola was writing the movie as it was shooting, cast members were coming down with horrible tropical illnesses, massive typhoons were hitting the islands, a fire broke out, there were tiger attacks, people threw wild parties with cocaine, and Marlon Brando had an epic diva complex. After a typhoon hit and production needed to stop for a month, several crew members would not return to the jungle with Coppola. Martin Sheen decided to go back but with great reluctance, he even told friends, "I don't know if I'm going to live through this." And he almost did not, Sheen later suffered a heart attack on location. Obstacle: Stanley Kubrick's desire for perfection. The stories that have come out regarding the filming of Stanley Kubrick's masterpiece The Shining (1980) are legendary. Kubrick is known as a perfectionist, one of the most meticulous directors in Hollywood history. He is also known as a multiple take director, often shooting scenes again and again, until he deems them perfect. 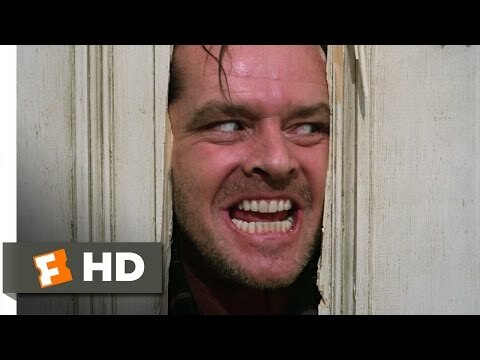 For example, the famous, but very short, "Here's Johnny" scene (above) which features Jack Torrance (Jack Nicholson) putting an ax through a door, took three days to shoot and used over 60 doors. Production of the horror movie was only supposed to last 100 days; it lasted 250. Kubrick was reportedly so hard on actress Shelley Duvall that her hair began to fall out, and she almost suffered a nervous breakdown. Kubrick also decided to shoot the film in chronological order, which makes production inconvenient and extremely time consuming.